We are a leading Manufacturer of groundnut continuous roaster from Coimbatore, India. 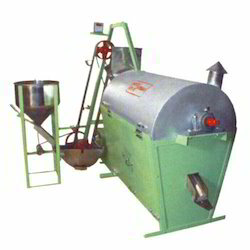 Used to Groundnut Continuous Roaster to roasted groundnuts which is used in the making of groundnut bars. Groundnut is roasted along with sand to get the traditional aroma and sand is segregated from the groundnut nd ecycled in the machine . Separate machine is available for breaking graund nuts.and removing skin.